The greatest thing about Panoramio is our community. Users take photos of the world that everyone can enjoy in Google Earth, Google Maps and many other properties thanks to our Panoramio API. While exploring the world, the Panoramio Community likes to have fun and get to know each other in what they call “Panomeetings”. Panomeetings are events organized directly from the community. They can be anything from a coffee with your local Panoramio friends in Asunción (Paraguay), to a weekend in O Grove (Spain) to enjoy the best seafood of the region, or even a weekend in Hungary while organizing an exhibition of Panoramio photos in a local gallery. 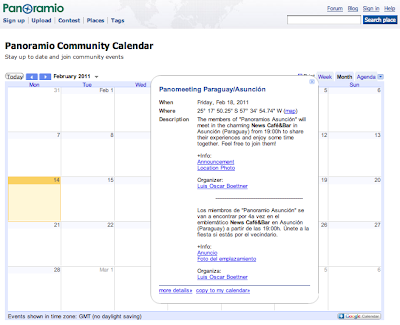 On the Panoramio Events page you will get an overview of the activities for that month and by clicking on the event you will get all the details such as timing, location, etc. 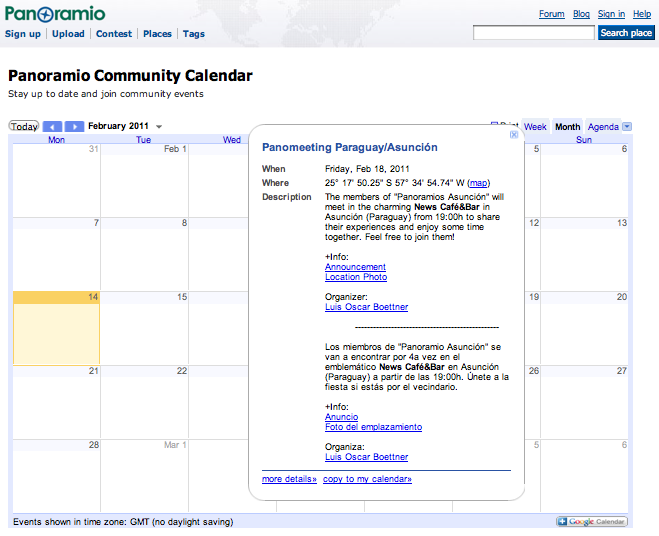 The first event to be sponsored in our Events page is the upcoming meeting of Panoramio Users in Asunción, Paraguay. Do you want to join them for a coffee? Check the event entry for further details. Feel free to organize your own Panomeeting, and if you do not feel so adventurous, just join us in the next one. I can promise by experience that they are so much fun!